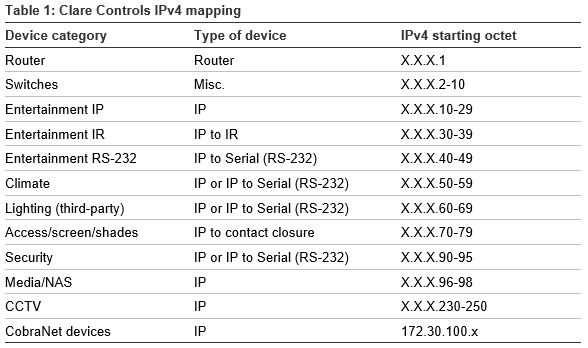 Use this document as a guide for IPv4 organization. As an integrator, it is important to know which IP addresses are going to which devices. This chart suggests an easy way to keep track of them, having a standard structure for all projects to follow. The chart lists what type of device it is, and it gives a range of numbers for the last octet of the IP address of each device. You can use any IPv4 scheme you choose, simply change the last octet to match the chart below. CobraNet must be on a separate network and use the scheme 172.30.100.X. Not all of these devices will possess an IP address if connected directly to a CLIQ module. DHCP range will be X.X.X.100-200.